We’re in the eve of what could turn out to be the most important tech event for the year - the unveiling of the next-gen iPhone. There’s a lot at stake, but whatever the next iPhone is, it will still be almost as much about the hardware as about the software. And with a massive App Store, which encompasses over 425,000 apps in some estimates, you certainly have a world of choice. 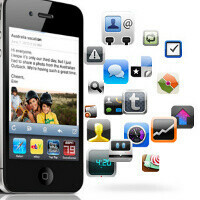 Gyroscope apps and games - the iPhone 4 has a gyro and it opens a world of possibilities for app and game devs. Angry Birds Rio - do we really need to explain? Rocket Bunnies - propelling rabbits in space. Think of something funnier? Infinity Blade - the hack and slash game with graphics that will make you drool. BackStab - Tomb Raider and Grand Theft Auto combined. Mad Wheels - racing goes multiplayer. The Heist - one of the best puzzlers for iOS. Skyfire - probably the best alternative to Safari mobile. Justwink - a fun greeting card app. iMuscle - one of the best apps for fitness buffs. PhotoForge 2 - image editing gets a boost. Don't forget to check our website at 10AM PST | 12PM CST | 1PM EST | 6PM GMT on October 4th for the latest about the next-gen iPhone.